As the Party Monarch of the South Coast, this three-star hotel is located in the St. Lawrence Gap area –the best known, most kicking party scenes in Barbados. Affectionately referred to as ‘Time Out’- this place was created for relaxation! Parties and local entertainment three times a week are the rule around the nicely landscaped pool and at the Whistling Frog Restaurant & Bar, outfitted with large screen TV, pool tables and dartboards. As the Party Monarch of the South Coast, this three-star hotel is located in the St. Lawrence Gap area –the best known, most kicking party scenes in Barbados. With its frequent happy hours, its ‘always happening’ bar even attracts local professionals who go there to mingle and be happy. The action just across the street at the breath-taking Dover Beach is Scuba diving, snorkeling, windsurfing, and sailing at its best. Our “Out and About” tour desk is ready to guide you through marvelous sight seeing and special events on the island. Available across the street at the breath-taking Dover Beach is scuba diving, snorkeling, windsurfing, and sailing at its best. Hotel has copy machine and conference room available. The hotel offers express check-in/out, recommendation on sightseeing tours and activities, car-rental service, laundry services, on-call doctor, ice machine, business centre, conference room, copy machine and parking. All rooms are spacious, cheerfully appointed with air-conditioning, mini-refrigerator, satellite TV, telephone, radio/alarm clock, hairdryer, iron with ironing board and complimentary in-room safe. 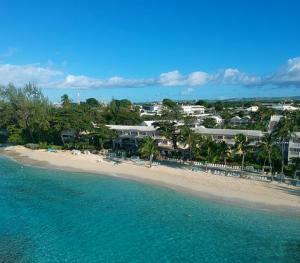 Hotel features discounted green fees, preferred tee times and complimentary transfers to Barbados Golf Club, theme nights and weekly Manager's cocktail party. Our Wedding planner will meet with you to discuss specific needs in advance and fine tune all arrangements. A ceremony may be arranged at many of the local churches or you may select one of the venue's of Gems Of Barbados. Our hotel's beauty salon offers special bridal hairdressing and make-up services. We can provide witnesses - Staff of Gems will be happy to oblige if desired. St. Lawrence Gap (night-clubs, bars and restaurants, Oistins (fishing town), Dover beach, shopping malls, supermarkets, banks, hairdressers are all nearby. 1 Bar offering Happy Hours twice daily.